Let’s get the big flashing misnomer out of the way: Not every stew at an Indian restaurant is a curry. It’s understandable how it’s become shorthand for “meat-filled spicy sauce to dip roti in,” but that’s a gross generalization for a cuisine that’s breathtaking in its diversity. Part of the problem is that some restaurant menus haven’t done the best job articulating the distinctions of a vindaloo from korma or tikka masala. “Lamb in savory sauce” and “chicken in aromatic gravy” isn’t exactly the most evocative description. What follows is a beginner’s cheat sheet to the dishes you’ll most likely encounter at your neighborhood Indian spot. True, there are ingredient commonalities: the spices used are typically a combination of turmeric, black pepper, chilies, cardamom, cloves, and the like. There is usually onion involved, sometimes tomato, and if there’s a sauce, it’s likely thickened with yogurt or cream (or both). But then it veers off into delicious tangents. 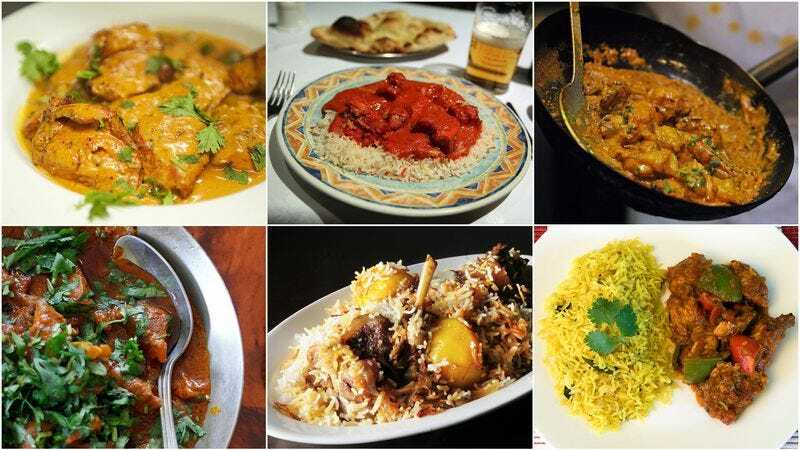 A brief preamble: It’s worth noting while the corpus of Indian cuisine is incredibly vast, the menus at Indian restaurants are dominated by what is called Mughlai cuisine, a category of north Indian food—born during the Mughal Empire—that’s laden with rich, gravy-based meat and vegetable stews. This is less a function of Mughlai cuisine being the best or most popular food in India, and more a function of the fact that many of the dishes within it use the same sauce (which, for a restaurant, makes them easy to produce in large quantities), and often involve meat (a seeming necessity for American palates). This is not to say the dishes aren’t delicious, but it’s a reminder that Indian food has a lot to offer beyond just what you’ll find at these restaurants. More British than Indian (it’s regarded by some as the national dish of England), chicken tikka masala begins with tandoori chicken, where the skinless bird has been marinated in a spiced yogurt sauce, then cooked in the tandoor (a clay oven) until juicy and smoky. Tandoori chicken in and of itself is a wonderful dish, but Chicken tikka masala takes it one step further, by simmering it in a sauce made of onions, tomatoes, and cream (or yogurt). The dish is known for its safety-cone-orange color, usually from turmeric and paprika in the sauce, but sometimes because of added orange food coloring. Some restaurants will give the tikka masala treatment to lamb or even beef, but chicken is the O.G. protein. Butter chicken is the classic Indian truck stop dish that’s as straightforward as it sounds: Chicken gets cooked in a tomato and butter gravy (or literally just butter) until the meat is fall-off-the-bone soft. Butter chicken will often look very similar to chicken tikka masala; the difference is that tikka masala has more of a complex, layered flavor from the spices, while butter chicken tastes like, well, butter, with a milder, sweeter gravy. Vindaloo is a south Indian dish with many variations. The version you’ll likely see in an Indian restaurant will include some kind of meat base cooked with red chilies, vinegar, garlic, and sometimes potatoes. In India, the dish is known for its unmitigated spiciness. But at your neighborhood Indian joint, chances are the heat has been tamed. Unless you ask for it. The name tells you everything you need to know: Chana = chickpeas. Masala = spices. Chana masala, which happens to be a very popular street food in northern India, consists of boiled chickpeas that have been cooked in a tomato-onion gravy. A special feature of chana masala is that the spices in it are often over-toasted—this is what gives the most flavorful versions of the dish its dark hue and deep roasted flavor. Korma is meat (usually chicken or lamb) braised in a garlic- and ginger-spiked yogurt sauce. It’s cooked using the low-and-slow method, so the yogurt doesn’t curdle, yielding a tender, mild stew. If your korma tastes extra rich, that’s probably because the gravy has ground cashews or almonds in it—an extra piece of flair often added to enrich the taste. With most Indian dishes, you can select your choice of meat. When it comes to rogan josh, lamb is the only option. The key to its smoky and sweet taste is the base, which consists of onions that have been browned in oil or ghee (clarified butter) until essentially caramelized, as well as the heavy dose of bracing, warming spices like whole cardamom and clove. You might see on a menu that the dish has chilies, but don’t worry—the chilies used in rogan josh are usually mild ones. If you’re at a good Indian restaurant, your rogan josh might be finished with a touch of saffron—an expensive spice with a delicate, floral flavor. There’s nothing not to love about biryani: soft, long-grain basmati rice, tender chunks of meat, layered, warm spices (cardamom is usually key), and loads of ghee (clarified butter), all cooked in a pot over slow fire. On the surface, biryani can look like just a pot of steamed rice, as there’s no actual “sauce” involved; what makes it truly luxurious is the way that the ghee clings onto—and enriches—each grain of rice and morsel of meat, and the aroma of the whole spices (most of which are left in the biryani itself) that’s totally all-consuming when you initially lift the top off the dish. There are countless takes on biryani, some vegetarian, some finished with raisins, some with gold foil on top for extra pizzazz. The point is, you can’t go wrong, no matter what kind you get. The name of the game here is sizzling meat and vegetables (or just vegetables) that have been dry-fried on very high heat with plenty of chilies. The dish is pretty spicy, as there’s no gravy to cut through the heat, though many restaurants will tone it down by adding cream or yogurt. This is a close analogue to stir-fry, or fajitas, but with the piquancy levels turned way, way up.